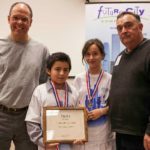 Now in its 10th year, the Future City competition for kids in grades 6–8 is gearing up for another season of challenging kids to imagine, design and build cities of the future. This school based competition begins as an engineering design challenge in regions across the country in September, progresses through regional competitions in January, and culminates with winners of those competitions advancing to the national finals in Washington, D.C. during Engineers Week! For the past two years, winners of the national finals have been invited to the White House! To put it simply, Future City rocks! Volunteers fuel the engine that makes the program run, and every fall the push is on for engineers to get involved as coaches, mentors, judges, and more. If engineering educational outreach interests you, you owe it to yourself to take a closer look at this dynamic program. To help you, I’ve listed what I believe are the most compelling reasons to consider Future City as your next volunteer activity. Ready? Here we go! 1. Help kids see the possibility of working in an engineering related field. In a recent program evaluation survey, more than half of the students involved said that their mentor actually helped them see themselves as engineers. These mentors also inspired kids to talk about joining more engineering related clubs, taking engineering courses in high school or college and pursuing engineering careers. 2. Help kids build bridges between the science concepts they are learning in school and real world engineering challenges. For example, last year’s competition and essay focused on energy. Students reported that although they were familiar with some concepts about energy when they joined their Future City team, their design /build activity helped them apply what they knew, as they made choices about alternative energy supplies for their cities. 3. Teach students how to work as a team. Using the engineering design process to solve real world problems, you, the teacher and students will research, design, build, test, evaluate and possibly redesign a winning model that illustrates a sustainable, futuristic city – together! 4. Be involved in an activity that develops students’ writing, public speaking, project and time management skills. Students have a set amount of time to plan and build their projects and prepare for their presentation before a panel of judges, where they will talk about the ideas that formed the foundation for their model. As an added bonus, because “teaching is learning” you may even more fully develop your communications and management skill sets as you work side-by-side with kids. 5. Help students become more informed citizens. Issues such as energy, taxes, politics, zoning, and others all come into play as the students create their future city. 85 percent of the students in last year’s program said Future City helped them learn and appreciate everything that goes into city planning and maintenance. 6. Give back because others have given to you. I recently heard a volunteer say that he wanted to give back because of the people who had motivated and inspired him to become an engineer. Here’s your chance! 7. Reach traditionally underserved communities. Future City teams are popping up everywhere! A knowledgeable coach, dedicated mentor, and curious kids with a willingness to learn are all that’s needed to get started and open the eyes of a student who previously was unexposed to engineering. Break down stereotypes, too, as you tell them your story about what it took to become a civil engineer. 8. Help meet the educational outreach goals of your Section or Branch. Outreach, not only builds public awareness about the role of civil engineering in your community and the world, but also attracts people to your organization who are looking for new ways to make an impact in their time outside of work. 8. Meet other professionals who share your passion for students – Although many Future City Mentors are other civil engineers, mentors represent dozens of engineering societies and professions. Networking through volunteer activities is a great way to meet people and build strong relationships in your community. 9. Have fun! This picture speaks a thousand words! Future City mentors spend, on average, 40 hours during the course of the school year. Nearly all who participated last year said the experience exceeded their expectations and they would recommend volunteering to a colleague. Sign up as a mentor at the official site. Not quite ready to commit to being a mentor? Consider volunteering as a judge to see what FC is all about. Or, check out the Future City Website to learn about being a sponsor or donor, volunteering at regional competitions, or serving on regional committees. So I’m asking you: Please, won’t you consider volunteering as a Future City Mentor this year? What is your experience with Future City? Do you think it helps kids explore engineering?